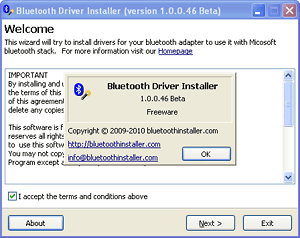 Bluetooth Driver Installer will try to install generic Microsoft driver for your bluetooth adapter. The program is based on a widely known method of patching %WinDir%\inf\bth.inf file. It works for most (but not all) bluetooth adapters, both USB dongles and built-in.